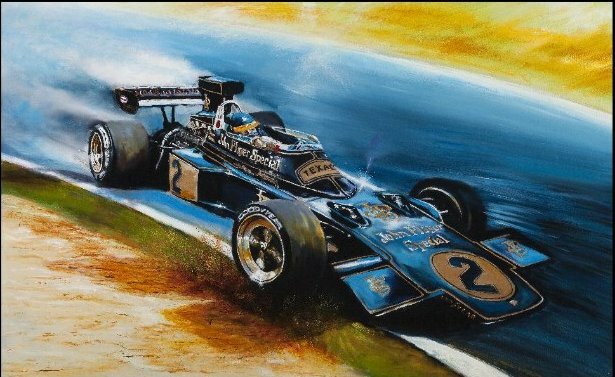 "RONNIE PETERSON - SUPER SWEDE "
The race was a demonstration run by the two Lotus 72s of Peterson and Emerson Fittipaldi. Sportingly, Peterson handed the lead over to Emerson in the latter’s bid to retain his Championship. However, the Brazilian retired and Ronnie took the win from Jackie Stewart, who would go on to win the title that year. D.J. knew a great driver when he saw one! 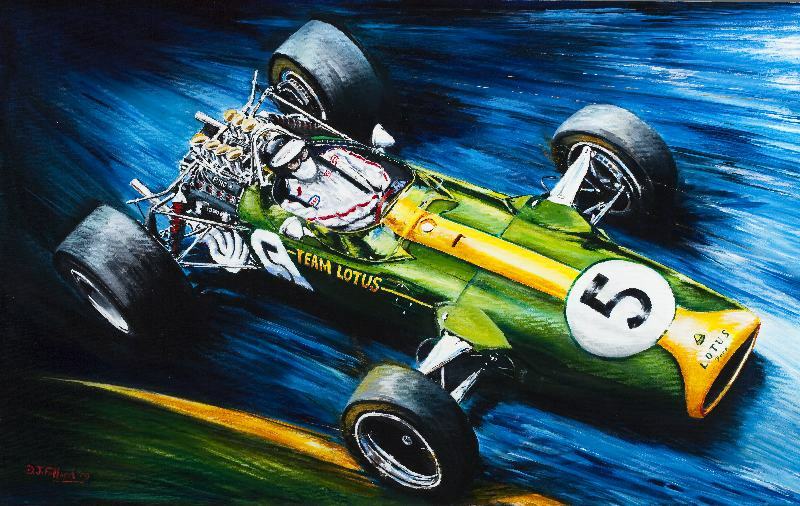 The incomparable Jim Clark pilots the Lotus 49 to victory on its debut appearance at Zandvoort, Holland in 1967. This model represented a significant leap forward in design, being the first time the engine became a structural feature of the car. Here claiming its first win, the legendary DFV Cosworth Ford engine would go on to achieve one hundred and fifty five Grands Prix wins, and twelve World Championships. Jim Clark was my boyhood hero – a driver of amazing versatility and ability, who made his mark in all areas of motorsport, including rallying, Formula 1 and saloon car racing. In 1965 he also famously won the Indianapolis 500 as well as becoming World Champion for the second time. His performance and character inspired my love of the sport, and it was a great sadness when he lost his life in 1968 at Hockenheim.